^ "Globe numbers look promising – CommonWealth Magazine". CommonWealth Magazine. 2016-10-03. Retrieved 2017-06-24. ^ a b c "The Boston Globe 'Encyclo'". Nieman Lab. Retrieved 2017-06-24. ^ a b Haughney, Christine (2013-08-03). "New York Times Company Sells Boston Globe". The New York Times. ISSN 0362-4331. Retrieved 2017-06-24. ^ Lepore, Jill (2019-01-28). "Does Journalism Have a Future". The New Yorker. Retrieved 2019-02-03. ^ "About the Boston Weekly Globe". Chronicling America. The Library of Congress. Retrieved 2015-11-09. ^ Martin, Douglas (2002-03-15). "Thomas Winship, Ex-Editor of Boston Globe, Dies at 81". The New York Times. ISSN 0362-4331. Retrieved 2017-01-13. ^ Barringer, Felicity (1999-07-13). "THE MEDIA BUSINESS; Times Company Replaces Publisher at Boston Globe". The New York Times. ISSN 0362-4331. Retrieved 2017-02-16. ^ Seward, Zachary M. (Feb 17, 2009). "Top 15 newspaper sites of 2008". ^ Barnes, Henry (2016-01-13). "Spotlight: meet the reporters who told the story nobody wanted to hear". The Guardian. ISSN 0261-3077. Retrieved 2017-09-29. ^ Horrigan, Jeff (1 August 2005). "HALL OF FAME NOTEBOOK; Gammons shows off write stuff". Boston Herald. GALE Infotrac Newsstand. p. 76. ^ "Charlie Savage of The Boston Globe". Pulitzer.org. Retrieved 2017-01-12. ^ "Boston Globe—Brief History". columbia.edu. January 13, 2017. Retrieved 2017-06-07. ^ "Boston Globe Appoints New CEO". Boston, MA Patch. 2016-12-08. Retrieved 2016-12-09. ^ Seiffert, Don (18 July 2017). "Boston Globe CEO steps down after less than seven months". Boston Business Journal. Retrieved 19 July 2017. (Registration required (help)). ^ Harris, David L. (2016-07-16). 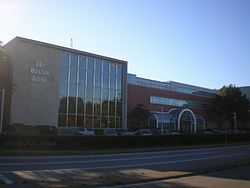 "Boston Globe reaches deal to sell its Dorchester HQ, but details are scarce". Boston Business Journal. Retrieved 2016-07-18. ^ a b Ellement, John R.; Andersen, Travis; Valencia, Milton (2018-08-30). "Calif. man charged with threatening to kill Globe employees he called 'enemy of the people'". The Boston Globe. Retrieved 2018-08-30. ^ Editorial, Board (2018-08-16). "Journalists Are Not The Enemy". The Boston Globe. Retrieved 2018-08-30. ^ "Hillary Clinton deserves Democratic nomination". The Boston Globe. 2016-01-24. ^ Wootson, Cleve. "'Not the enemy of the people': 70 news organizations will blast Trump's attack on the media". New York Times. Retrieved 13 August 2018. ^ "Globe calls for war of words against Trump media attacks". Associated Press. Retrieved 13 August 2018. ^ Stelter, Brian. "More than 100 newspapers will publish editorials decrying Trump's anti-press rhetoric". CNNMoney. Retrieved 13 August 2018. ^ Reiss, Jaclyn. "200 newspapers join Globe effort on freedom of the press editorials". www.msn.com. Retrieved 15 August 2018. ^ "RTDNA calls on members to join campaign defending press freedom". rtdna.org. Retrieved 15 August 2018. ^ "Boston Globe seeks coordinated editorial to stand up to attack on journalism – CNPA". cnpa.com. Retrieved 15 August 2018. ^ Scarry, Eddie (15 August 2018). "Media coordinate with each other to battle Trump". Washington Examiner. Retrieved 15 August 2018. ^ Duke, Selwyn. "Media Collusion: 100-plus Papers Agree to Simultaneously Run Anti-Trump Editorials". The New American. Retrieved 15 August 2018. ^ Flood, Brian (15 August 2018). "Coordinated anti-Trump editorials 'sure to backfire,' critic warns". Fox News. Retrieved 15 August 2018. ^ Kimm, Mary. "Opinion: Editorial: Freedom of the Press, Friend of Democracy". McLean Connection. Retrieved 15 August 2018. ^ "Editorial: President Trump, we are not the nation's enemy". The Mercury News. 15 August 2018. Retrieved 15 August 2018. ^ "Opinion: Editorial: Freedom of the Press, Friend of Democracy". Baltimore Sun. Retrieved 15 August 2018. ^ "Editorial effort in support of the free press sparks both praise and pushback - The Boston Globe". BostonGlobe.com. Retrieved 17 August 2018. ^ Stendahl, Max. "Trump slams Globe's op-ed project, makes false claim about 2013 sale". www.bizjournals.com. Retrieved 17 August 2018. ^ "Boston Globe steps up security due to bomb threat in wake of Trump tweet". WHDH 7News. Retrieved 17 August 2018. ^ "Boston Globe Reports Bomb Threat as President Trump Assails the Paper". Democracy Now!. Retrieved 17 August 2018. ^ Snider, Mike. "Boston Globe gets bomb threat after editorial blasts President Donald Trump's media attacks". USA TODAY. Retrieved 17 August 2018. ^ Swidey, Neil (December 13, 2017). "Bostonian of the Year 2017: The concussion researcher". The Boston Globe. Retrieved 19 December 2017. ^ "The 2014 Pulitzer Prize Winners: Breaking News Reporting". Retrieved 15 February 2018. ^ "Kathleen Kingsbury of The Boston Globe". www.pulitzer.org. Retrieved 15 February 2018. ^ "Farah Stockman of The Boston Globe". www.pulitzer.org. Retrieved 15 February 2018. ^ "Jessica Rinaldi of The Boston Globe". www.pulitzer.org. Retrieved 15 February 2018. ^ "Globe launches on-line service". The Boston Globe. 30 October 1995. ^ Seiffert, Don (2018-10-09). 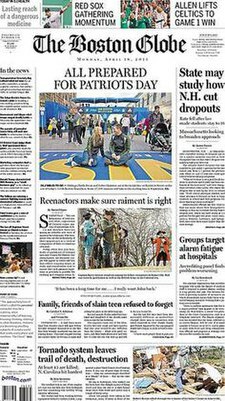 ""Several months late, Boston Globe hits online subscription milestone"". Boston Business Journal. Retrieved 2018-10-10. ^ Clark, Anna (23 February 2016). "Why STAT is the media startup to envy". Columbia Journalism Review. Retrieved 26 October 2016. ^ a b "Globe Readers And Non-profits Together". manage.bostonglobe.com. Retrieved 2017-01-13.